Alright, a lot in this post. International folks, I'm still working on figuring out your rates, so bare with me. Really looking for help with distribution and willing to make really awesome deals to people who want to help us out. So if you table, have a bunch of friends, have a distro/bookstore/infoshop, or have a bookstore in mind that you think should carry Black and Green Press titles, please write to blackandgreenpress [a} gmail dot com. That includes international folks, because I want to get stuff out there. Bands, distros: I'll send cases of Peregrine CDs if you can distribute them, write to the address above. Please note: Black and Green Review is likely to continue it's upward momentum, having jumped from 128 pages for issues one and two to a whooping 216 pages this time! There is a chance that the subscription rates may have to go up, but we're open to other ideas to lower them for those willing to discuss. We want to get as many out there as possible, as cheaply as possible, so if you have the want, we can find the way! 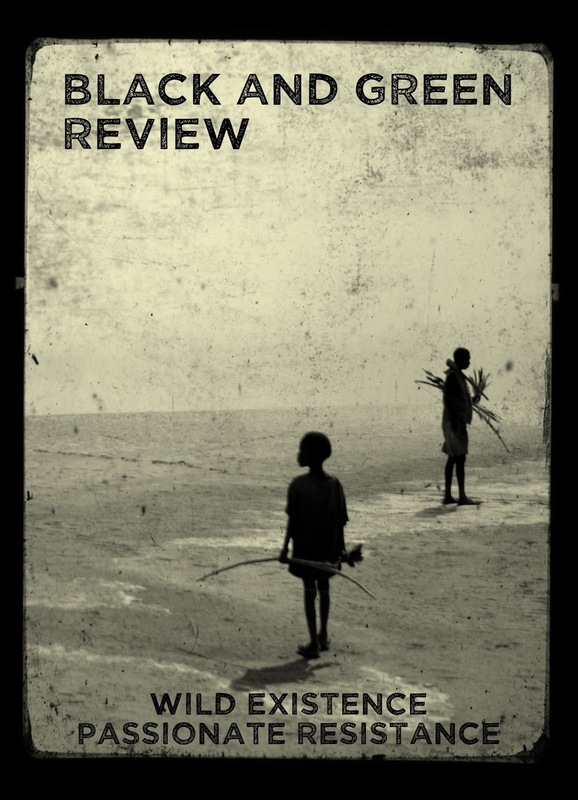 For those who are unaware: Black and Green Review is an anarcho-primitivist journal brought to you by editors of Species Traitor and Green Anarchy that focuses on expanding on anti-civilization critique and praxis. It's broken up into four sections: essays, discussion, field notes from the primal war, and reviews. If you have not checked it out, you are missing out! For a wild existence and a passionate resistance. BAGR no 3 features essays by Kevin Tucker, Four Legged Human, John Zerzan and Ian Smith. Contributions from Cliff Hayes, Jeriah Bowser and Story Teller and interviews with Lauren Regan, Josh Harper, a group of BC green anarchists and our anonymous anthropologist. For a more detailed look inside no 3, click here. It is currently at the printer and will ship out to all subscribers, distributors and everyone else by May 20th. Subscriptions and pre-orders are strongly encouraged to get in before then as there will be delays in filling orders immediately after the first round ships. Here's the list of goods below, anything you don't see and want to inquire about, email the address above. BAGR shirt: pre-order closes on Wednesday April 27th. BAGR subscription: starts with no 3. BAGR pack: single copy of issues 1, 2 and 3. B&G Press pack: single copy of every title. BAGR 1&2: single copy of each. International option available. Single copy of BAGR3. International option available. BAGR shirt. Pre-order closes on Wednesday April 27th. Will ship mid-May. Black shirt, khaki print. Sizes small-xxxlarge. $20 ppd within the US. BAGR Subscription: starts with no 3. International options available. BAGR pack: single copy of issues 1, 2, and 3: $18 ppd US addresses only.